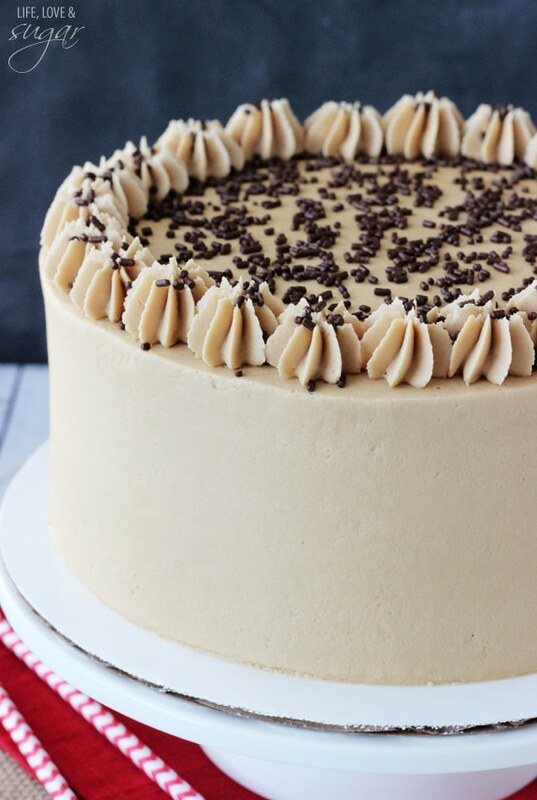 This Caramel Mocha Chocolate Cake recipe is inspired by the Starbucks Caramel Frappuccino! But before I dive too much into the cake and get lost, we have to celebrate! What are we celebrating? It’s the hubs and I’s 5 year wedding anniversary today! Five years ago today, I was getting ready to marry my high school sweetheart (we’ve been together since we were 17) and party the night away! 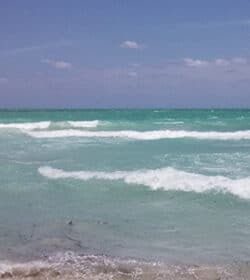 Can I go back? It was seriously the most fun day ever. Some people say they never want to plan another wedding after theirs is over, but I planned ours with my mom and I tell you – we’d easily do again. SO fun! The designer side of me loved everything about it. I’d plan your wedding, if you let me. I actually have a link to a part of our wedding video I can share if you’d like to see. I love, love, love watching our wedding video! Crown Alley Films is THE BEST there is and he travels. Just sayin’. We watch it together every year and one of our favorite parts is re-watching the ceremony. It’s funny how much more the vows and what was said during the ceremony means now that we’ve been through a few years of marriage. That has become the hubs and I’s favorite part of weddings. I wish the clip was the part of me and the hubs when we were talking photos because it’s so cute and fun. But the one that was posted online focuses on my mom and I. If you want to see it, here’s the link. I warn you though – it’s a lot of me. Which is kind of embarrassing. Yet, I love it anyway. So anyways, now that we know why we are celebrating, let’s get to the cake. I actually made a little single layer replica of our cake for our anniversary last year. So I kept it simple this time around. The cake base used in this recipe is my absolute favorite chocolate cake recipe and if you try it, you will never make another chocolate cake. It’s amazing. Plus I put a little hidden surprise in there for you – Kahlua. 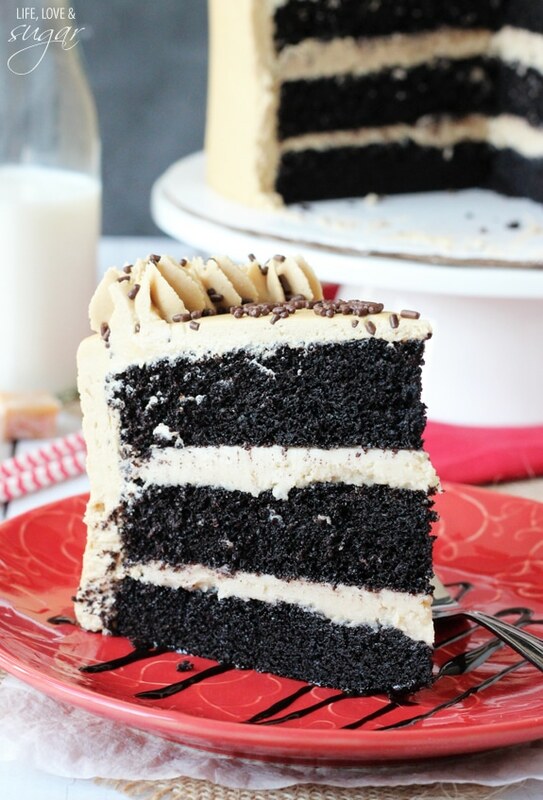 I can’t decide if I like Baileys or Kahlua better, but Kahlua found it’s way into this cake. It’s subtle, but there. 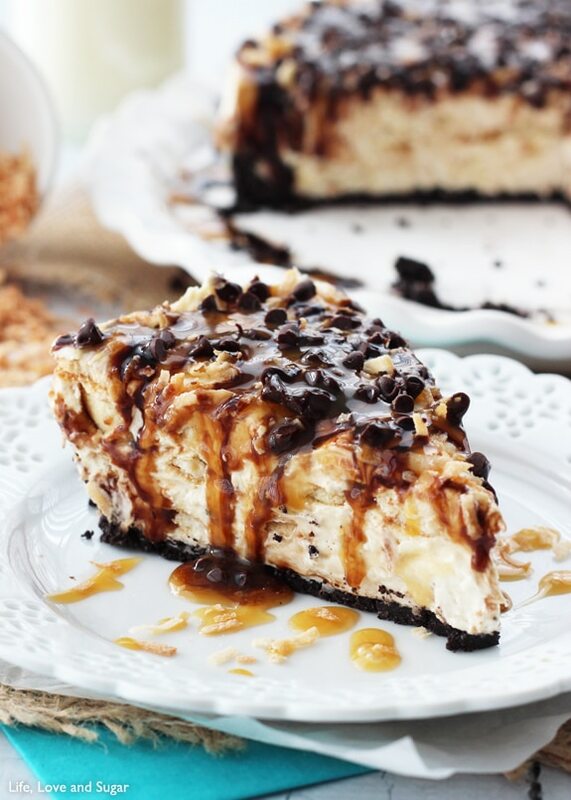 The filling is a wonderful caramel icing. I could live off of caramel icing. And the icing is full of coffee. Which means that you can totally have this cake for breakfast. It’ll be your caffeine. You’re welcome. Together, they make a stellar combo that we couldn’t get enough of. Yum! 1. Preheat oven to 300 degrees. Grease three 8 inch pans. 3. Add eggs, buttermilk, vegetable oil and kahlua to the dry ingredients and mix well. 5. Pour into cake pans and bake for about 30-35 minutes, or until a toothpick comes out with a few crumbs. 6. Remove from oven and allow to cool for about 7-9 minutes, then remove to a cooling rack. 1. Dissolve the instant espresso coffee in the water. 2. Beat the shortening and butter until smooth. 3. 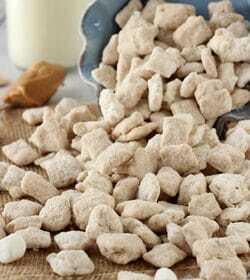 Slowly add 3 cups of powdered sugar. Mix until combined. 4. Mix in the vanilla extract and half of the espresso coffee water. 5. Add the rest of the powdered sugar and mix until smooth. Add more espresso until you are happy with the coffee flavor. 1. Cut the domes off of the 3 cake layers with a serrated knife. 2. 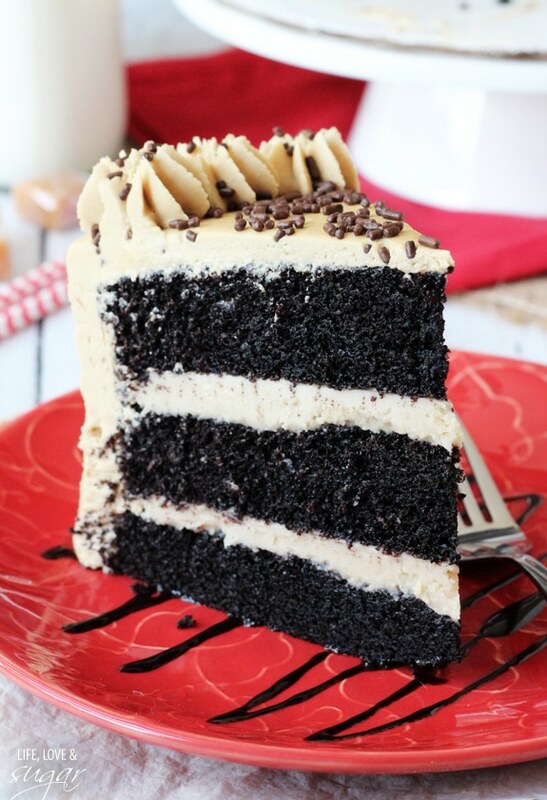 Place first cake layer onto your cake plate and add half of the caramel icing. It will be thick. Spread into an even layer. 3. Add second layer of cake and top with over half of caramel icing. 4. Top with the third layer of cake. 5. 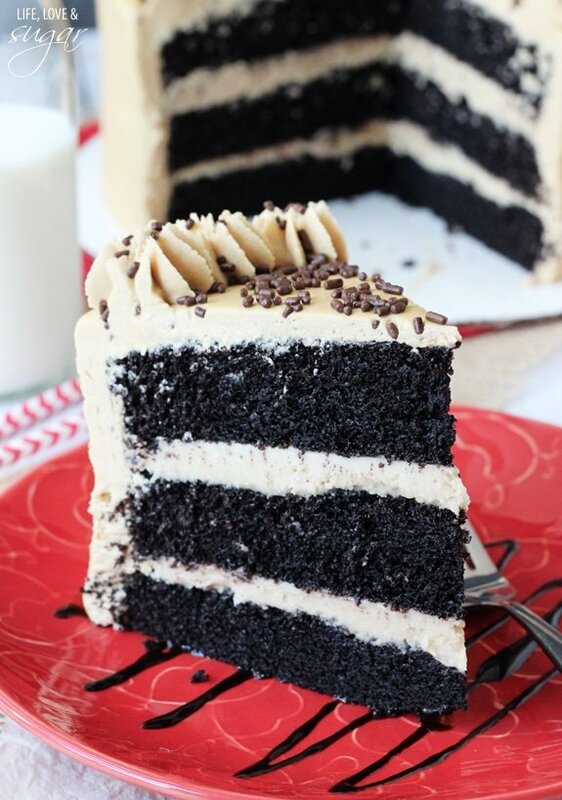 Spread a thin layer of coffee icing around the outside of the cake, filling in any holes. 6. Use the rest of the coffee icing to frost the outside of the cake. Decorate as desired. Girl you know how to celebrate an anniversary! I just went out for dinner and ordered dessert for ours – I didn’t even make it. Bad food blogger! Great to meet you too! This is totally breakfast food, lol. Do you use both fostings? Yes, it might be hard to tell in the picture because they are similar colors, but the caramel icing is inside the cake and the coffee icing is on the outside. I updated the instructions to make that more clear. Thanks! Thanks Taylor! Great to meet you too! Congratulations on your anniversary!! Today is our anniversary too…props to May 23rd being the day to get married 🙂 Now where is my slice of cake? Holy yum! That is definitely my kind of cake. Chocolate, caramel, and coffee all married together in one amazing looking cake!! Love it! Girl, you have a gift of making some beautiful cakes!! Happy Anniversary to you and your hubby! Hope it’s a great one! That looks divine!!! Your recipes always look amazing and your pictures are always gorgeous!!! 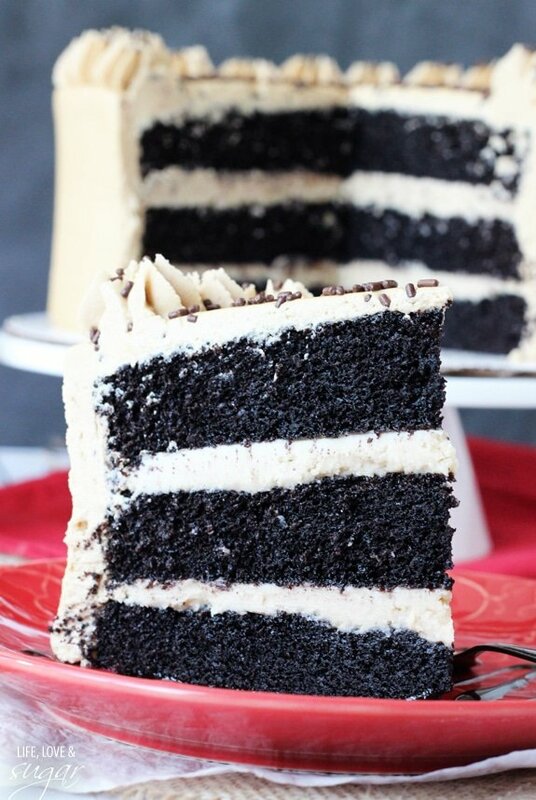 The darkness of that cake is making me drool. I want a huge slice!! Happy Anniversary!!!!!! Everything about this cake is calling to me. But if I’m being completely honest – I’d make the icing and eat it out of a bowl by itself…. I am so with you when it comes to coffee. Nothing beats a good Caramel Frappuccino :). Wait… except for this cake. I don’t think one could bake a cake that looks any more perfect than this one. Beautiful and I bet it tastes absolutely amazing. This cake sounds and looks amazing!! 🙂 Can I use Bailey’s instead of Kahlua in this cake? Happy Anniversary! This is definitely one awesome cake to celebrate with! Pinned and shared on FB! I need a twelve step program to deal with my chocolate thing. Thanks for including the link to the wedding video. You made a stunningly beautiful bride. It is a joy to see daughters and moms loving and enjoying one another. Your mom is gorgeous too. Oh, and the cake: knocked it out of the park, my friend. Thank you so much! I love looking back at that video – I’m glad you enjoyed it too. I love the relationship I have with my mom and value it so much. And we both would do that whole wedding process all over again – it was so much fun to do it together. I’m so glad the cake was a hit! I just made this cake, and it lives up to the hype. My only complaint is with the coffee icing. I am not a fan of icings made with shortening. if I replace the shortening with butter, do I use the same amount? I’m glad you enjoyed it! Feel free to replace shortening with butter, it is the same amount. Hi! I’m a new baker so I don’t understand some things as I go along making different recipes. I’m making this cake this week and just had a question. What is the reason for adding the vanilla to boiling water? It saves a mixing step by adding it to the water, then the batter. It’s not imperative to do it that way though. 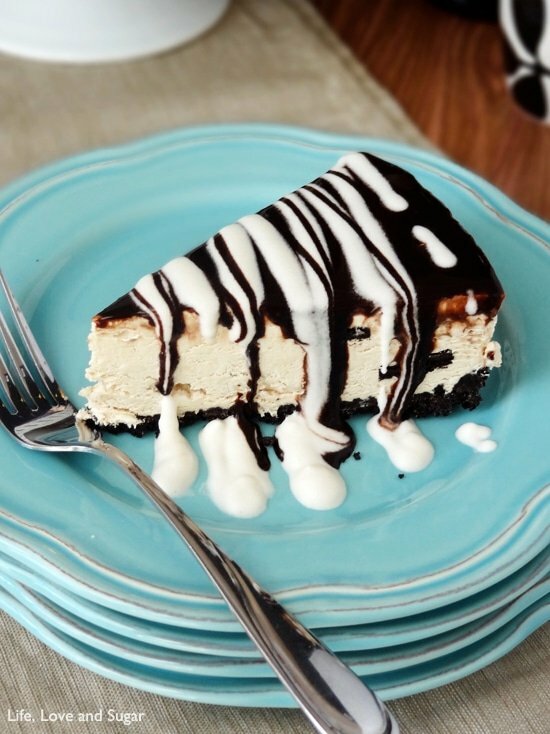 What are the recipe amounts to make this a sheet cake? I haven’t made it as a sheet cake, so I’m not sure. Also what is a substitute for buttermilk for this cake? In this particular cake, you can also use regular milk. Can i make this a sheet cake? 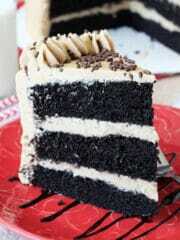 Woww this cake looks absolutely delicious! I was wondering if I can use something else instead of the shortening? Yes, just replace with additional butter. What can be substituted for the kahlua? I’m scared it might be too dry if i leave it out! Thanks! Add additional water in place of it. Hi, Lindsay. Hope you are doing well. I am a big fan of your recipes, especially your Best Chocolate Cake. I made it recently and it was a success! I also want to try your Caramel Mocha Chocolate Cake, but I don’t know what kahlua is. Is it a mandatory ingredient? I’m so glad to hear you enjoy the recipes! Kahlua is a liqueur that has a coffee flavor to it. You could leave it out if you prefer. Just replace it with additional water. I use 8×2 inch pans. And yes, three of them. This looks amazing! Making it for my daughters birthday this weekend! I don’t have 3 8” pans- but I do have 2 10” pans- think that would work? I’m going to have to do some math if you don’t know???? That should be fine. It’ll just be a shorter cake. Could I sub coffee for the boiling water or would that be overpowering?? hi! hoping to try this cake out soon, but had a question- could i substitute coffee for the kahula? This looks amazing! I’ve been looking for a chocolate espresso cupcake recipe for my wedding (yes, we’re making our own cupcakes!! 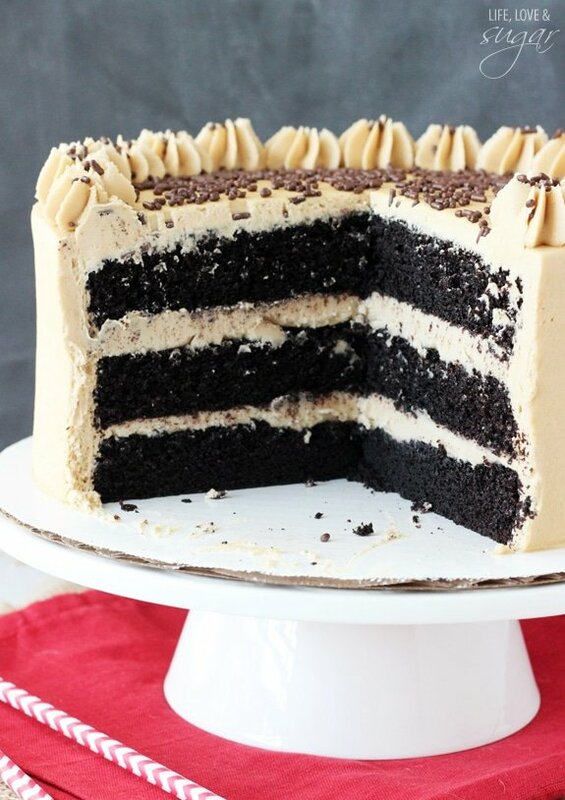 ), and I’ve found an amazing espresso frosting, but still searching for a coffee chocolate (/mocha) cupcake base…..can this recipe be made as cupcakes? How would you adjust oven temp/cook times? 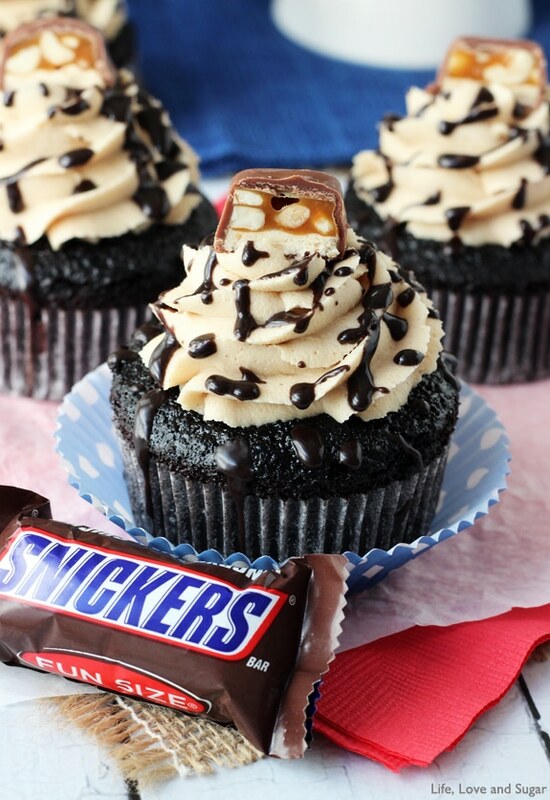 Yes, this recipe can be made as cupcakes. Fill the liners about half way, bake at the same temperature for about 18-20 minutes. 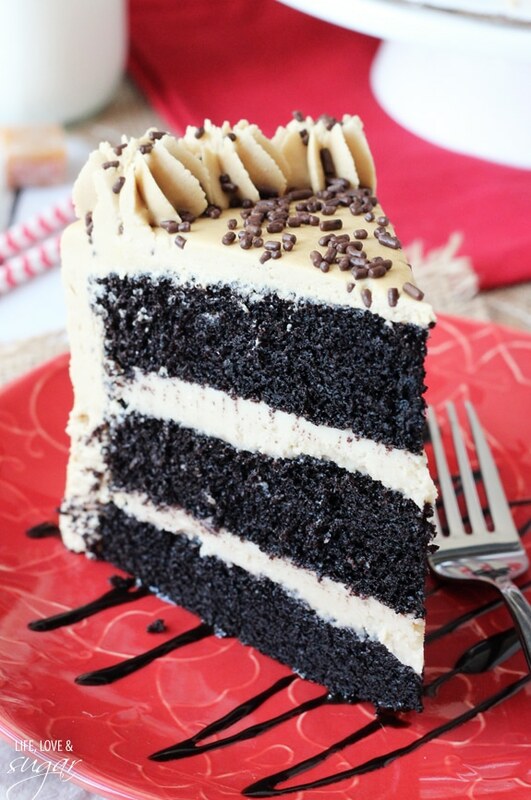 I would check out my Kahlua Coffee Chocolate Layer Cake for adding in the coffee.